Let’s take a “deep dive” into yoga! This delightful board book invites children ages 0–4 to join in a healthy and fun series of easy yoga poses. Ten friendly sea creatures show the way. The book also includes complete yoga instructions for parents and caretakers. Let’s take a “deep dive” into yoga! This delightful board book invites children ages 0–4 to join in a fun series of easy yoga poses. Whale, Jellyfish, Dolphin, Starfish, and six more friendly sea creatures show the way. 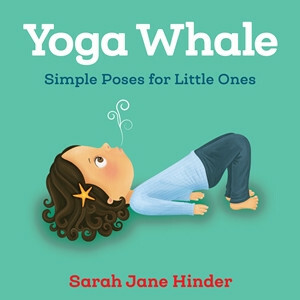 Yoga Whale, the third offering in our bestselling yoga board book series, keeps the healthy fun going. Includes complete yoga instructions for parents and caretakers. Waving tentacles in the sea. Eight hellos to you and me. Bobbing up and down beneath the waves. Spiral tail with spiny scales. Breathe in and feel your tummy grow. Then breathe out, nice and slow. Creepy crawly in the sand.
. . . and five other oceanic friends!